This is one of my all-time favourite cakes. It is easy to make, and people love it. 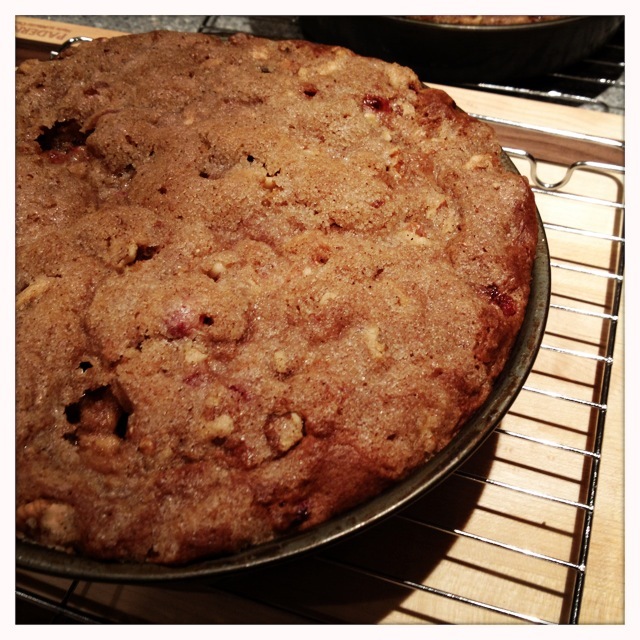 The tartness of the cranberries balances out the sweetness of the walnut topping. I sometimes make it in a big 9×11 pan, but often in two round or square pans so I can freeze one or give it to someone. I also make this as a rhubarb cake, but only in the summer when I’ve got rhubarb coming up in my garden. I often make this to bring to someone’s house when I don’t know what else to bring, because so far everyone who has tried it has loved it. You can’t go wrong! 2. Cream butter and brown sugar, then blend in egg. 3. Sift together flour, baking soda and salt. 4. Mix one-third of the flour mixture into the butter mixture with a wooden spoon. 5. Add half the yogurt and mix until just incorporated. 6. Mix in one-third more of the flour, then the rest of the yogurt, then the rest of the flour. Mix until just combined or it will make a tough cake! 7. Add cranberries, then pour into a buttered 9 x 13 inch pan (or two round or square 9-inch pans), smoothing the top a little. 8. To make the topping, melt the butter, then stir in the rest of the ingredients. Spread if over top of the batter. 9. Bake for about 40 minutes, or until a toothpick inserted in the cake comes out clean.